The Department of Genetics was established as the Department of Medical Genetics in 1965 as a new direction for The Henry Phipps Institute; an Institute that was founded in 1903 for the study, treatment and prevention of tuberculosis and subsequently broadened to include research in other communicable diseases. The School of Medicine realized that with the increasing role genetics was playing in clinical medicine, it deserved Departmental recognition. Accordingly, the School recruited Rupert E. Billingham, F.R.S., an internationally known English tissue transplantation immunologist who had come to the Wistar Institute in 1955, as the Department’s first Chair. Accompanying Dr. Billingham from Wistar to form the “nucleus” of the new Department in 1965 were Dr. Paul Moorhead (a cytogeneticist), Dr. Andrzej Kozinski (a phage geneticist), Dr. Darcy Wilson (an immunologist), and Dr. Willys Silvers (a mammalian geneticist). Dr. Billingham also recruited Dr. Wayne Streilein, a young internist who had completed his medical school and residency training here at Penn, into the Department. During Mellman’s period as the Chair, Dr. Harry Harris, F.R.S. was recruited. Dr. Harris had been Galton Professor and head of the Department of Human Genetics at the University College London (succeeding L.S. Penrose). Dr. Harris who really was the “father of Human Biochemical Genetics,” (and the author of “The Principles of Human Biochemical Genetics”) came to Penn as a Harnwell Professor. Dr. Mellman and Dr. Moorhead had both spent sabbatical years in Dr. Harris’ lab in London and the school was fortunate to attract him to Philadelphia. In 1981, Dr. Roy Schmickel, a Professor of Pediatrics at Michigan, was appointed as the third Chair of the Department. It was during Schmickel’s term as Chair that the Howard Hughes Medical Institute was established at Penn and as a result, five faculty members recruited during Schmickel’s term were all given Hughes appointments. Dr. Haig Kazazian, who was Professor of Pediatrics at The Johns Hopkins School of Medicine, was recruited as the Department’s fourth Chair in 1994. Dr. Kazazian oversaw a significant increase in both the size of the department and overall N.I.H. funding, from roughly $4 million to $10 million per year. Dr. Tom Kadesch was appointed Interim Chair of Genetics in the summer of 2006, bringing over 21 years of experience as a member of the Department. He successfully recruited two junior faculty members and a PIK Associate Professor. He also encouraged a sense of community among investigators who share an interest in genetics, hosting two genetics symposiums on campus. We were all deeply saddened by the untimely death of Dr. Kadesch in January 2011, but once again, the Department found strength within its own faculty, naming Dr. Stephen Liebhaber the new Interim Chair. 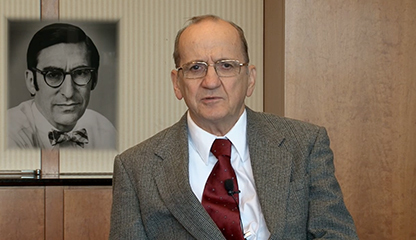 Dr. Liebhaber boasts a lifetime commitment to Penn, as he has been a member of the Department since 1982. He successfully recruited two junior faculty members, Dr. Yoseph Barash and Dr. Casey Brown, during his time as Interim Chair. In 2014 Dr. Daniel Rader was appointed as the Department's fifth standing Chair. Dr. Rader has been a faculty member at Penn since 1994 in the Department of Medicine engaged in research in human genetics, model systems, and translational medicine.